The millennials, also known as Gen Y’ers, are the generation with tons of options and a lot more ways that help them figure out the right ones for them. Millennials love analyzing and making very informed decisions about everything in their life, given the Internet has made this process quite easy. They have different expectations for their lives and look for uniqueness in all aspects. The majority of real estate markets nowadays consist of a large number of millennial home buyers. It’s important to understand what features home buyers are looking for in a home and to know how to make sure those features are being showcased, especially when targeting millennial home buyers. So, if you’re thinking about selling your home in the Rochester NY area or you’re a real estate professional wondering what really needs to be brought to a millennial home buyers attention, you’ve come to the right place! Below are the top 15 things Millennial home buyers look for when they’re buying a house! Many millennial home buyers are often buying a home on a budget. This means that buying a home with dated bathrooms that need updating is often a turnoff for millennial home buyers. It’s important to understand what the current bathroom design trends are when selling a home. Millennial home buyers are looking for comfort in a bathroom but also the current “trendy” bathroom designs. A kitchen is not just about cooking for millennials. Millennial home buyers are looking for a kitchen that flows with the rest of the rooms in a home, especially the living space where guests may gather. It’s important that your kitchen is stylish and updated with integrated appliances and gorgeous designs because this is important to millennial home buyers. An excellent idea when targeting millennial home buyers when selling a home is to stage your kitchen. Staging your kitchen can really bring out it’s stylish features and also showcase some of the updates your kitchen has! Living in the era of technology, smart home features have impacted the real estate industry significantly and they’re a must when targeting millennial home buyers. Homes equipped with smart home features are very attractive to millennials and these buyers are often willing to pay higher prices for these homes. One of the most popular smart home features that millennial home buyers are currently looking for include automated or voice devices that control appliances, lighting systems, heating systems, and garage doors, such as Amazon’s “Alexa” or Google Home. These devices are appealing to millennials because they’re also able to be controlled through their smartphones while they’re away from home. Technology has rapidly reduced the need to travel back and forth from an office for work. More and more millennials are looking for careers that don’t require a physical office location but rather can be done from the comfort of their home or remotely. Homes that have a dedicated workspace are attractive to millennial home buyers because they’re able to envision themselves working from the comfort of their home. One great way to showcase a dedicated workspace is to consider staging a spare bedroom or area within your home as an office. Creating a dedicated workspace within your home is a great budget friendly staging tip that can result in millennial home buyers falling in love with your home. Millennials desire homes that look fancy and upscale, however, most of the millennials are also looking for a home that has a very little maintenance. Millennial home buyers would prefer to spend their time relaxing on weekends rather than spending time completing home maintenance tasks and repairs. It’s important that when targeting millennial home buyers you stress that your home has a low cost of maintenance. This can be accomplished by pointing out features such as a new roof, new windows, low maintenance vinyl siding, and high efficiency HVAC systems. There are many millennials who place a strong importance on being “Green.” Homes that offer energy efficient features are more appealing to millennials than homes that don’t. If you’re looking for ways to make a home more energy efficient, consider installing LED lights or using a programmable thermostat. These features can be attractive to millennials because they often result in saving money on utility bills. While having an energy efficient home isn’t the only deciding factor for millennials, it’s becoming more and more important! An often overlooked feature that millennials are looking for in a home is a separate laundry room. While it may not seem like a big deal, having a well defined and separate laundry space is attractive to millennials. If you’re considering a low cost home improvement project prior to listing your home for sale, you may want to consider creating a cozy laundry room. This includes installing some shelving or installing a folding table. Completing these low cost improvements to your home can go along way with attracting millennial home buyers! Be it linen closets, a spacious garage, or walk-in pantry, millennials are looking for separate storage spaces that are well hidden or defined in their designs. They want rooms in their home to have space for their creativity and expansion as well as have a good capacity for storage. Storage capacity are one of the most important features that millennial home buyers look for when buying a house along with laundry rooms. Location, location, location! It’s a saying that’s used on a daily basis in the real estate industry. The location of a home is very important to buyers in general. When it comes to millennials, it becomes even more important. For example, if you’re selling a multi family home in the country, you need to understand that many millennials prefer to be in a location that has easy access to major metropolitan areas, so targeting millennials might not be the best game plan for your home sale! On the other hand, if your home is located close by to many attractions, bars, restaurants, and places of interest, it’s highly suggested this is highlighted in your homes listing. Bottom line, choosing the right neighborhood to buy a home in has risen to the top of the list of importance for millennial home buyers! In addition to low cost maintenance, millennials are also looking for easy maintenance in their home. Spending hours each month vacuuming and shampooing carpeting in a home is not attractive to most millennial home buyers. For this reason, hardwood flooring has become very important to millennials. Not only is hardwood flooring easier to maintain, it often lasts longer than carpeting. Check out these current hardwood flooring trends to see if you’re homes flooring will be attractive to millennials. While installing hardwood flooring isn’t the cheapest improvement project, it might be worth the investment as it can bring in millennial home buyers in bunches. Millennials typically don’t enjoy a well-structured floor plan with rooms that have a very defined purpose. Instead, they like to float some ideas with open floor plans that they can convert based on their needs. They look for large spaces in living rooms, family rooms, and their kitchen, which often becomes their main entertaining space. It’s also not uncommon to see millennials converting a formal dining room into a more creative space such as an office or workout area. When it comes to millennial home buyers, the outside of your home is often as important as the inside. Millennials are looking for a home with outdoor space that will give them the liberty to have a BBQ with friends or to simply relax. If you’re looking to draw millennial home buyers to your home when selling, you need to have the goal of creating an outdoor oasis in mind. The majority of Millennials will pay more for a home that has an amazing outdoor space that features a sprawling deck or patio. Unlike the older generations millennials want their homes to express strongly a sense of individuality. It is not necessary if the home of interest is a bungalow or a condo. What matters is how much liberty it gives them to create an individualized space that holds a personalized beauty to it. So, instead of a specific style such as a contemporary or traditional the home should have an open end with possibilities for a mixture of ideas to be expressed. Millennials are looking for optimized use of spaces that is just enough for its purpose. Except for the rooms they spend a majority of time in, they look for compact spaces that can accommodate basic necessities for a cozy home. Over the past several years, tiny homes have become more popular with millennial home buyers. You might be asking yourself, “what is a tiny home?” Tiny homes are generally less than 500 square feet but provide all of the necessities to live, which is often what millennials are on the lookout for. The major takeaway is that millennials are not generally looking for a “McMansion,” but for a home that provides space to serve it’s purpose of providing somewhere to live. Like location, the community is also a very important aspect of interest for millennials. The majority of millennials are not shy when it comes to getting involved with their communities and neighborhoods. Millennial home buyers have shown an increase of interest in communities such as golf course communities and pet friendly communities. If you’re selling a home that’s situated in a strong community, you need to highlight this! Millennial home buyers will continue to play a large role in the real estate industry. 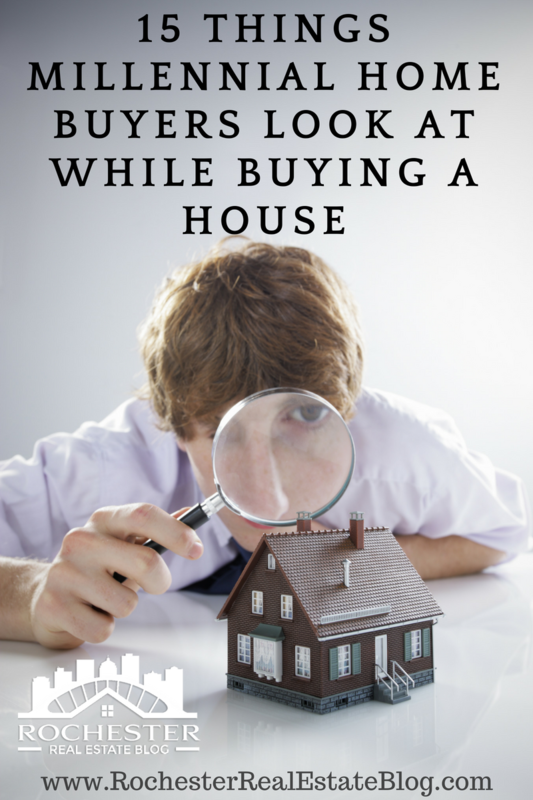 Since they make up such a large portion of potential home buyers, it’s vital you understand the above things they’re looking for when shopping for houses. Homeowners and real estate agents who understand these things and who know how to highlight them greatly improve their chances of a quick and profitable home sale. About The Author: The above article “15 Things Millennial Home Buyers Look At While Buying A House” was written by Jessica Smith. Jessica is a long distance single-family real estate investor and the Senior Editor for Elite Garage Door. After a few years of success in real estate, she felt compelled to teach people real estate and home improvement is more profitable than they might think and far less risky than they assume.